Every day your skin is bombarded with free-radicals, generated by exposure to the sun and environmental pollutants. The damage contributes to the skin's visible aging process, which includes dryness, the appearance of fine lines, and changes in color and texture. skin repair and cellular rejuvenation. Your skin, the body's largest organ, is a reflection of your overall health and well-being. A clear and radiant glow requires proper nourishment - both internally and externally. Order your own Skin Care! Nutrition: Nourish the Body from the Inside! Healthy looking and balanced skin .... naturally! Healthy looking and nourished hair ... naturally! One of our most sought after products! 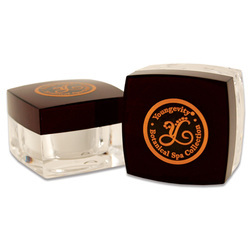 Waterless Vitamin C reduces the visible signs of aging, fine lines, and wrinkles. with improved texture, tone, and overall radiance. It's an absolute necessity as a primer under our Mineral Make-Up! 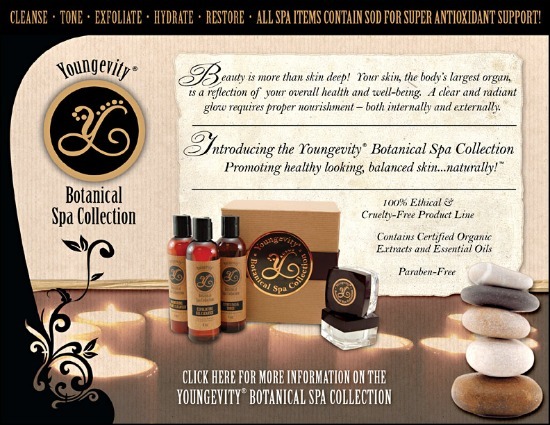 Youngevity’s Premium Skin Care System is a two-step process designed to mimic the effects of today’s most popular skin treatments without the expensive, invasiveness or recovery time of clinical treatments. Both products in the system, the Premium Enzyme Peel and Premium Night Cream, contain exotic, renowned anti-aging breakthroughs from around the globe unleashing dramatic, anti-aging activity on the skin’s surface and also deep within its underlying collagen matrix. The Premium Skin Care System delivers an advanced skin treatment every night for a renewed, glowing complexion every morning!